Want to wield a Rocket Launcher, shoot down giant bugs, while at the same time completely destroy all the buildings in the city? Well you’re in luck as you can do just that in Earth Defence Force 2025 by Namco Bandai. As a member of the EDF you’re tasked with helping change the tide in a war against a constantly evolving enemy. Can you help save the day? Think you’re brave enough to take down these bugs? And don’t think for a second I’m talking about the ones you find in your back garden. 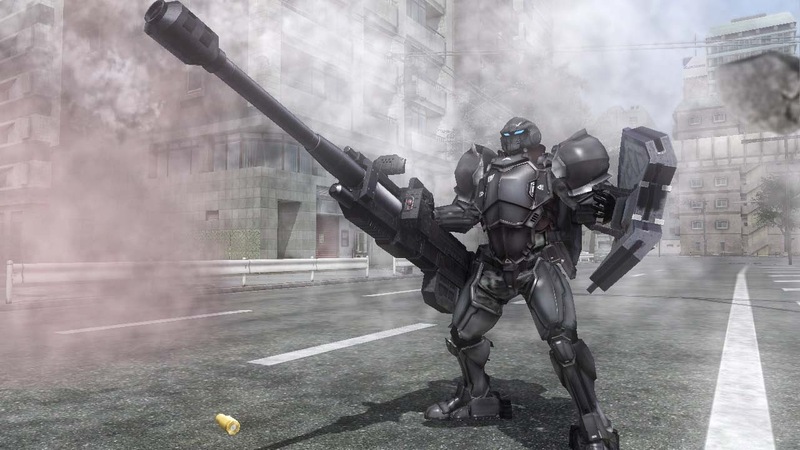 In Earth Defence Force 2025, these bugs are the size of buildings and after many years have now returned to continue their invasion of the planet. Mission mode is where the chunk of the game is at and the cool thing is that you can play this alone or with a friend via split screen. This is split into different stages with each giving a small update on what’s happening so far. It’s almost like saying it has a story, but nothing that really seems to stand out. Come at me bro... COME AT ME!!! Before starting a mission there are a couple of options that are available for you to choose from with more being unlocked as you go on. To begin with there are four classes; Ranger, Wing Diver, Air Raider and Fencer each with their own unique properties and skills. Take for example the Ranger, its recommended for first time players to pick this class due to being easily accessible and versatile through its use of a wide range of weapons, something that can handle any situation. You also get to choose what weapon to equip with Rangers being able to equip two weapons. The goal is mainly to wipe out the enemies present in the area and these come at you in waves spanning more than 100 of them each so expect to cause a lot of destruction. On the early stages you would probably expect 1 to 3 waves, however as things move on lookout for at least 5 to 10 or even more. There is something about taking down all these insects that just seems to make the gameplay addictive maybe because it reminds me a lot of the old school shooters, but instead translated into 3D. During missions pickups will be dropped and these go towards restoring your health, armour and unlocking more powerful weapons for use. You can see what perks you acquired at the end of each mission. Can't mess with me and my team. One of the biggest aspects that brings gamers together I feel that is missing nowadays is split screen, so imagine my joy when I found out that is was included in the game. You and one other player can go through the main missions together and team up to take down the hordes. While it works for the most parts, the game does tend to slow down when things become a little too crazy on screen, especially when there are too many insects or buildings are being destroyed. Too keep up with today, you can also team up and play online with four others. The biggest impact that Earth Defence Force 2025 gives is through the destruction of its environment that’s succumbing to a massive battle between the EDF troops and the invasion. Crumbling buildings, walkways, malls you name it, nothing is safe in this war. Quite frankly if the textures could have been bumped up a little more it would have made for quite the spectacle, however with so much happening on screen I can understand why this wouldn’t be possible. Guns, insects screeching, screaming civilians and buildings crumbling are some of the sounds you’ll be hearing while you do battle. If there is one thing that severely bothers me, it’s the conversations between your team mates. A lot of the time they’ll be speaking to each other during battle and some of the things that come up can sometimes be downright hilarious and not make sense at all. This is coupled with the fact that the voice acting itself is not that great either making for a dreadful listen. The game can be played between three difficulties, so it’s good to see that it can be changed later on should you find things a little too challenging. When a stage is completed, you receive a medal which showcases which level you completed it at; Easy, Normal, Hard, Hardest and Inferno. You'll pretty much be fighting everything! The one massive problem I encountered was the civilians present. While they do make things seem a lot more realistic with all their running and screaming and “save me”, on more than one occasion, they just completely get in the way. I can’t count how many times I busted out my Rocket Launcher, set it off at an insect only to have a civilian run in the way and send me flying and oh did I mention that they are practically invincible against my Rocket Launcher, however once a bug gets its hands on them, they are just prey? If anything I felt it would have worked out better if they were incorporated better into the gameplay like earning some perks for saving them all. There is a map available in the top right corner which gives you the heads up on oncoming enemies, living team mates and any pickups that you've forgotten about and are still within the area. It’s something about having the odds against you and in this case, shooting down a ton of bugs that seems to get your adrenaline pumping and make the game addictive. While it would have been ideal to have a better knit story, in all honesty it didn’t really need one as Earth Defence Force 2025 greatest strength was in its gameplay.